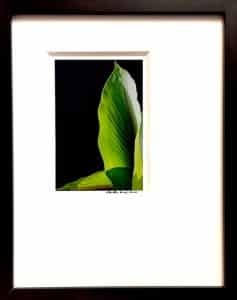 Canna Leaves, an in situ artwork arranged by Nature and illuminated by the Sun is a 3 x 4.5” image on archival paper, and framed in an unique fashion. This piece is from my archived, Floral series. Shown below is a snapshot of the artwork in an 8 x 11” metal frame and glazed with museum glass. This is an edition of one, the original, there are no copies. The artwork was selected for the River Oaks Square Arts Center’s, 2nd Annual 5x5x5 “Triple 5” National Miniature Show and Competition. This miniature art show coincides with the gift-giving season. The juror was Louisiana-born and Covington-based, painter, Linda Dautreuil. Triple 5 is on show from November 17th, 2017 to February 10th, 2018 at River Oaks Square Arts Center, 1330 Second St, Alexandria, Louisiana 71301. Thanks Pete. Happy you like it!